Vocational nursing student Tracy Martinez is looking forward to the end of her vocational studies and to the beginning of the new registered nursing program at CBC Pleasaonton. Tracy Martinez of Stockton, Texas is leaving Coastal Bend College … with plans to come right back. Martinez and 74 of her classmates are taking part in the annual pinning and lighting ceremony on Aug. 20 at 10 a.m. at CBC Main Campus in Beeville, commemorating the end of their vocational nursing studies. Martinez, like many others, plans to return next semester to continue into the next phase of nursing studies leading to becoming a registered nurse. Martinez will be in the first Pleasanton Campus cohort. 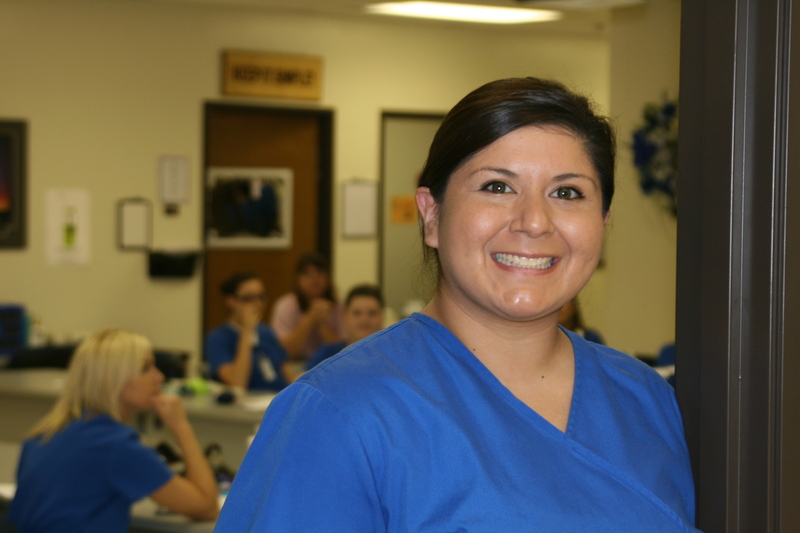 Coastal Bend College offers nursing students several entrances and exits within the nursing program. This multi-entry/exit program creates continuity in educating certified nursing assistants, vocational nurses and registered nurses. “The goal is to transition certified nurses’ assistants very easily into vocational nursing and to get LVNs very easily into registered nursing and so on,” said Betty Sims, CBC Director of Nursing. CBC’s curriculum for nurse education is delivered in a clinically-intensive program. Instruction covers the four basic areas of nursing care: adults, mothers and newborns, children and the elderly. Classroom instruction is also required in mental health/mental illness concepts. Martinez plans to take her licensing test immediately and wants to work at a nursing home. “I want to get into an Alsheimer’s Unit. You don’t know what you are going to get from day to day in that environment,” she explained.